NASA's MAVEN spacecraft, shown here in an artist's illustration, celebrated one year in Mars orbit on Sept. 21, 2015. NASA's newest Mars probe has now been circling the Red Planet for a year. The Mars Atmosphere and Volatile EvolutioN (MAVEN) spacecraft arrived in orbit around the Red Planet on Sept. 21, 2014, 10 months after blasting off from Florida's Cape Canaveral Air Force Station. Everything is going well so far with the $671 million mission, and all of MAVEN's systems and instruments are in good shape, team members said. "We're obtaining an incredibly rich data set that is on track to answer the questions we originally posed for MAVEN and that will serve the planetary science community for a long time to come," MAVEN principal investigator Bruce Jakosky, of the University of Colorado's Laboratory for Atmospheric and Space Physics in Boulder, said in a statement. MAVEN's first year at Mars has been quite eventful. In October 2014, for example, the spacecraft survived the close approach of Comet Siding Spring, which zoomed within just 87,000 miles (139,500 kilometers) of the Red Planet's surface. 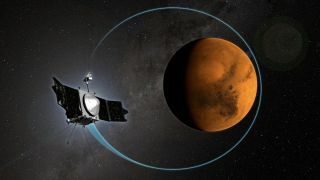 Observations by MAVEN, NASA's Mars Reconnaissance Orbiter (MRO) and Europe's Mars Express spacecraft revealed that dust and other material shed by the comet created a temporary layer high up in the Red Planet's atmosphere. MAVEN has also spotted auroral displays — similar to the northern and southern lights here on Earth — that penetrate surprisingly deeply into the Martian atmosphere and discovered a strange dust cloud that extends from about 93 miles (150 km) above the planet's surface to an altitude of 190 miles (300 km). The spacecraft can also serve a relay function, helping link up communications between NASA's Opportunity and Curiosity rovers and their handlers on Earth. MAVEN's primary, one-year mission will end this November, but NASA has extended the probe's operations through at least September 2016. MAVEN, MRO and Mars Express are three of five operational spacecraft currently studying the Red Planet from orbit. The others are NASA's Mars Odyssey probe and India's first-ever Red Planet spacecraft, which is known as Mangalyaan. Mangalyaan marks its one-year Mars anniversary tomorrow (Sept. 24).